Substitutes, I don’t have to tell you that you have a unique and challenging job, especially when it comes to classroom management. Great question. One that, to be honest, I didn’t feel completely qualified to answer, having not had much experience as a sub myself. So I put it out to my Facebook group (which is amazing, by the way, and you can request to join here). And they didn’t disappoint. Here’s some of the great advice from substitute teachers (and some of my own advice sprinkled in). Don’t ever view yourself as “just the sub.” The students might imagine this is a free day, but that should never be our point of view. We’ve got to have high expectations and a definite goal of helping these students actually learn something new. If we expect things to go poorly, there’s about a 99.999% chance that they will. Always be armed with extra activities. If the teacher doesn’t have an activity to start class, have one ready to go. That will give you time to get adjusted and should provide a less-chaotic start to the class (See my post “how to start class without the chaos” for more details.) Extra activities are also great in case students finish early and become disruptive. Learn their names as fast as you can. Start memorizing their names while you take attendance – the “good” kids as well as the challenging ones. This builds relationships and helps you accurately report problems to the teacher. – Laura T.
Let them know your expectations. Tell them you are a guest teacher and explain what you want from them. – Patricia D.
Identify a “helpful student” and ask them about procedures. If possible, ask the teacher ahead of time for the name of a helpful student. If they don’t provide one, try to identify one by asking a question about a procedure and seeing who volunteers an answer (and seems trustworthy). When you’re not sure how you should handle a procedure, quietly ask that student (when the rest of the class is doing something else), “When do you guys normally take a restroom break?” etc. Learn & adapt standard classroom management techniques. Don’t fall into the trap of thinking “I can’t do that because I’m a sub.” Most classroom management techniques work across the board or can be adapted to work for relief teachers. You can sign up for my free classroom management minicourse or check out some of my recent classroom management articles. Substitute teachers, we’d love to hear from you. What else helps you gain & keep your students’ attention? I play a particular game with elementary-aged students throughout the day. It’s really simple and takes no prep, but kids go crazy over it and always want to participate. I call it “Thumbs Up, Thumbs Down” and it’s really just a take on Two Truths & A Lie. Basically I tell the kids three facts about myself, and after each one they have to guess whether it’s a “thumbs up” (I’m telling the truth) or a “thumbs down” (I’m telling a lie). They do the corresponding action, which conveniently means they don’t need to talk to play the game! After I model it, I pick a few kids to have a turn talking. I usually ask them to do two statements each (any longer and their classmates start losing focus). How this helps with classroom management: If the kids take to the game (and they usually do), I string reminders throughout the day that I’m only picking well-behaved, polite students to take a turn at the game. Individual kids will often come up to me and ask, “Mrs. C, can I be the next person to play Thumbs Up, Thumbs Down?” and that gives me an authentic, organic opportunity to be able to discuss their behaviour with them. I think these are great steps to take. I need to remember to stay positive from the start and make my expectations clear for the students. 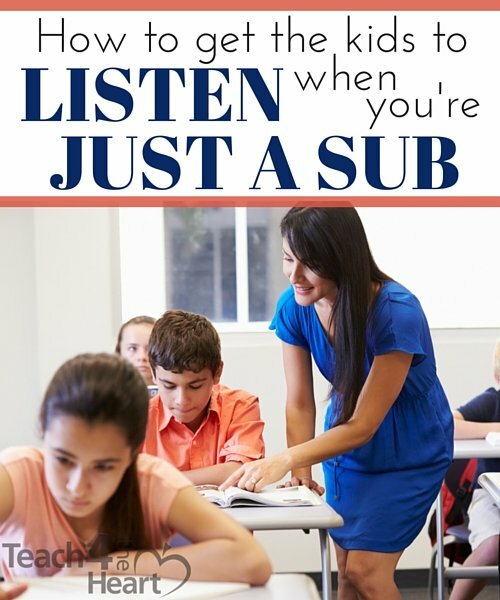 I don’t refer to myself as “the substitute” – when I introduce myself, I tell the students, “I’m your teacher today.” Even in elementary school (where I usually sub), I think that helps set the students’ expectations (I have had students try the, “You’re not my real teacher; you’re just a sub” line even in younger grades). I also remind them right off the bat that I might do things a bit differently than their regular teacher, and from the very first make it clear that I’m the one in charge of the classroom. Younger kids especially are burning to be helpful, and if you aren’t quick to nip this in the bud, you’ll have half the class arguing with you about how their teacher normally does it, and often all talking at once to do it. I always try to get into my classroom as early as possible to review the lesson plans. The more familiar you are with the day’s schedule and lessons, the more confident you will be in front of the class. I’ve found the more confident that I am (or am able to pretend to be, in cases where I’m having to wing it!) the more likely the kids are to listen and follow my directions. In middle school, I find that if you’re given an activity for the day ask them to do it independently and quietly for 5-10 minutes. If they can pull that off they’re usually good to work in groups/partners and can handle more privileges. When subbing in high school (where I’m usually at) make sure you keep the line of friendly/professional clear. Some students intentionally ask a bunch of personal questions or plead with you to ~be cool~ in order to distract you from the task at hand. Whether a teenager thinks your cool or not doesn’t really factor much into whether they’ll listen to you or not. Though I think the most important thing as a Sub (or teacher in general) is to have a sense of humor! It’ll keep you sane during the rough days and it’ll help you relate to the class clowns in a good way! I have just subbed my first few high school classes and am looking for ways to help manage the classes. For the most part I have been successful in starting the class by introducing myself, laying out the expectations and providing clear directions for their assignments. I then walk around the class to see who needs help. In one of my last classes I had a really hard time from the onset. The students were coming into the class and would not quiet down. They were so loud and would not even take a break for me to introduce myself. I tried using my outside voice to get their attention to introduce myself, but to no avail. I was doomed…. The Discipline Dean had to come into the room to get it under control. I felt like a failure. I have bought a bell that might help and plan to use that to get the attention next time, but what else might you suggest. I am having a hard time with finding substitute classroom management for high school students. I have not found that this school has put any sort of rewards / discipline systems in place and was thinking about bringing some sort of reward in for positive students. I would like to know how to handle this too. I have had the same issues with students cussing, yelling, throwing things around the room etc. The noise level was so loud we didn’t hear the fire bell go off. I had the principal come in the room many times through out the day. The students and principal said this was a normal day for them. That was the second class at the same school like that. I won’t go back to that school. Vicki – AGREED. Sadly this has happened to me too, recently. There are 2 elementary schools I will not work at any more, because of the behavior. It’s plain ridiculous. I’ve found some very helpful classroom behavior videos on Youtube by Dr. Bill Rodger’s Behavior Management and Teaching with Bayley. The videos give examples of some real classrooms that teachers have lost control of and how to support them. When students, most, see a sub come in, they have it in their minds already that “it is party time,” and most things you try won’t reverse that biased. Sometimes it doesn’t seem to matter how many of these great classroom management ideas I use. There are just groups that are going to be “that class”. Worst day ever was when a student that wasn’t even in my class walked in, ignored requests to leave, and started a fist fight with a student in my class. I went home and cried, and it took every bit of mental strength in me to get up and go sub at the same school the next day. It’s a very rough middle school. That’s super tough. Yes, all you can do is your best. So focus on doing that and try not to let the bad days bother you too much. I guest teach lower elementary usually. I always remind my kids that today somethings will be the same and somethings will be different. And that is ok. Also when ever I talk to child, one to one, I get down to their level and I make eye contact. I always look for opportunities to remind them that they are filled with all kinds of “Awesomeness”. And they need to share it. When a child makes a poor decision, then I just remind them that when they make decisions like that, it distracts from their awesomeness. I tell them I can still see it, but it is harder for others to see it. I sometimes will ask them to take a quiet moment to think about how they can make better choices. I remind them that I want them to shine but not to cast shadows on others. This always seems to work. I have been subbing or guest teaching over the last year. I always introduce myself and let the students know that I have over 20 some years of experience and in many grades so I have seen the behavior that they will try to get away with. I also let them know that I will follow the teacher’s set rules and that I will not be changing them for one day IE, bathroom breaks, snack time, water bottles. I do tell them that I will follow what has been written down and if I don’t have any notification that it most likely will not be done or allowed. I have also told every class that I have not left any “bad” notes this year and I would hate to have their classroom be the first. It usually makes them change the path that they are thinking about taking. I do tell them that I love leaving positive notes and encourage the teacher to reward the class as a whole because of the great day we had together. At the end of the day I will ask them to rate their behavior on a scale of 1 to 5, with 5 being the best. They need to compare themselves to how they would be with their regular teacher. They can be much more critical than I would be. I expect students to try to get away with some things as they wouldn’t with their regular teacher and give them some slack for this. I am a retired teacher and I have written a book about one day in the life of a substitute teacher. The book is entitled “GOOD MORNING CLASS.” It is interesting, informative, and can be helpful to all teachers. After 15 years of teaching high school Sped reading classes, I retired and moved to Oahu, Hi. I know, you are saying lucky lady, but Sped teachers can go anywhere with some extra perks! In Hawaii, I chose to guest teach at the elementary level. The children are awesome and California “touching ” issues. The are full inclusion, a regular AND a Sped teacher in each room, Awesome! I guest teach in elementary schools in FL, primarily in Title I schools in a low income area. I have a natural connection with young children and I enjoy teaching. For every assignment, I dress professionally and arrive early with my sub kit, a positive attitude, a friendly greeting and introduction, learn the students’ names quickly, have several classroom management strategies at hand and…many times, none of that matters. Some days are good but most of the time, all of my planning, preparation and intent to follow the regular teacher’s lesson plans go out the window because it’s party time. I spend most of the day managing chaos. Even after going over the class rules and explaining that we will follow the teacher’s plan and I will leave a note on how the day went, a lot of students choose to do their own thing. They talk when I’m talking, tattle on each other, fall out of their chairs, rush me with questions, randomly leave their desks, refuse to follow directions, etc. The actual amount of learning time we achieve is minimal. That bothers me because I do not sub to be a glorified babysitter. I want students to learn and I strive to make the most out of the school day. Typically, I build in little breaks and try to allow a little slack because kids will take advantage of having a sub. I walk around the room continually, helping students and using proximity to manage behavior. I avoid yelling and I try to remain calm and cool while attempting to refocus students and keep them on task. I do my best but many is the time I go home feeling like a failure because I had to send students to another classroom or another teacher stepped in to try to regain control of the class or I had to leave a negative note for any reason. It would be nice to just enjoy the day with the students and make a positive impact on them. Instead, I feel like it’s a matter of surviving the day and that life is too short for that kind of punishment, especially for low pay and no benefits. I love your honesty. Many people (who I really struggle to believe are actual teachers or have substituted) make you feel like it’s your fault that students do not want to listen. From one end you get the, “You’re too soft; you let kids walk all over you;” “You have to show ’em who’s boss.” “Don’t try to be their friend, it doesn’t matter if they like you.” “You have to address things like that.” The other end it’s, “Never yell at a student, it degrades your self-respect;” “You could get fired for that;” “Build relationships with them;” “You have to be patient.” Like, what am I doing wrong?! Being a substitute teacher is such an underratedly difficult job. I started subbing this August, so it hasn’t been very long per say. But already I will not return to two elementary schools because the behavior is so awful. The 3rd grades on up are mouthy, loud, disrespectful, and disruptive, even with their regular teachers. It’s ridiculous. I don’t know if this grounds from the home life, or on the playground with other kids. I am not a screamer, and will not holler or loud talk at the students all day. That’s too much on the stress to deal with. I too am at a loss when the students simply will not listen. When another teacher or disciplinarian walks in they are silent, this makes me feel like I a total failure and extremely disrespected. I refuse to scream at the top of my lungs as I feel that teaches them you only respond when the yelling gets to a certain decibel. Should I simply quit? I feel I am bad for the school in that the students are out of control when I am in charge. Have you tried implementing any of these strategies? Have you checked out the podcast? We have a whole season about Classroom Management. I think it takes trying a process of elimination. I had several groups in one day (freshmen) who were unruly and would not listen. The best strategy seemed to be quietly going around to those who WERE WORKING and asking for their names, writing the names down as positive reinforcement and letting the ones who were not working deal with the fact that they were not on that list. I then asked the ones I had not put on the list yet to return to their task as I passed them. Substitute teaching has definitely been a challenge regardless of which grade I am working with. It’s just plain ridiculous that a teacher or interventionist/disciplinarian has to step inside to help get the students situated. I never feel like a total failure with this, but completely irritated. And the staff realizes the class will only return to disorderly after they leave. My worst two have been 2nd and 3rd grades, of 4-5 staff intervening during the 2nd and 3rd hours. I have been released early from two jobs because the classes went out of control even with the staff involved. My health couldn’t take it. I don’t want to give too much information here but I have been subbing with the Chicago public school system for a year and just had one of my worst days ever. I had a week substitute assignment filling in for a teacher who went on sudden leave (this is 7-12 grade) in an obscure subject that I know nothing about and 99.9% of teachers couldn’t teach either. There was no work or lesson plans left, and there was no one in the school who can or would guide me. I tried teaching them what I know but each class was getting even more rebellious until It just fell apart on the 4th day, and my assignment was ended a day early. I had one student who refused to put her Chromebook away despite the fact that I told her several times to put it away. I had 3 choices at that point. 1. Ignore her and risk the other kids wouldn’t do the same thing (I know that isn’t happening). 3. Take the Chromebook away from her. I did the 3rd one and she then yanked it from me and is claiming I cut her. Is there a 4th option I am missing? I’ve learned a lot while substitute teaching after I “retired”. Most of the principles that worked well in my classroom apply to substitute teaching, but it is definitely much more challenging! I have a set of five expectations that I write on the board at the beginning of the day, and I review them at the beginning of each class. Each class is awarded up to five points for each expectation. I have a paper chart with the points for each expectation that I leave for the teacher. I also give a small reward to the students in the classes that get all or nearly all the points. I work in a small charter school and often see the same students while subbing for several teachers who teach different subjects to the same grade level. It amazes me how the same students behave differently in different rooms! Some things are established before we even get there, and are not going to change in a day! As a sub, I have far fewer consequences at my disposal and I have to let some things go but still have high, but realistic expectations. I’ve found that teachers also give good tips if I ask specific questions about how to work with certain students.